A team in China has decoded the genetic building blocks of the tea plant, Camellia sinensis, whose leaves are used for all types of tea, including black, green and oolong. The research gives an insight into the chemicals that give tea its flavour. "There are many diverse flavours, but the mystery is what determines or what is the genetic basis of tea flavours?" said plant geneticist Lizhi Gao of Kunming Institute of Botany, China, who led the research. "Together with the construction of genetic maps and new sequencing technologies, we are working on an updated tea tree genome that will investigate some of the flavour." The researchers found that the leaves of the tea plant contain high levels of chemicals that give tea its distinctive flavour. They include flavonoids and caffeine. Dr Monique Simmonds, deputy director of science at Kew Royal Botanic Gardens, UK, who is not connected with the research, said it provided an important insight into the genetic building blocks of tea. "Our lab has successfully sequenced and assembled more than 20 plant genomes," said Prof Gao, who carried out the work with scientists in South Korea and the US. Guy Barter, chief horticulturist at the Royal Horticultural Society (RHS), UK, said the work gave plant breeders a "powerful new tool". "Once you understand the basis for the flavours and the processing quality of the tea, you can then have genetic markers that breeders can look for when trying to produce new varieties," he told BBC News. 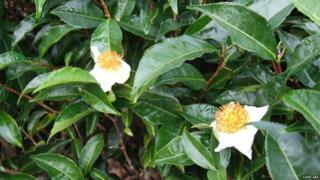 Six main types of tea are produced from Camellia sinensis - white, yellow, green, oolong, black and post-fermented. Each has its own aroma, taste and appearance. The distinctive flavours of these teas are created by their different chemical compositions. Dr Simmonds said knowledge of the genome of tea helped us understand how the plant evolved. ''Another important finding is that the biochemical pathways involved in the synthesis of the compounds important in the taste of tea are also present in some of the ancestors of tea and have been conserved for about 6.3 million years,'' she said.